Louisiana Takes Stock Of The Damage After Devastating Flooding : The Two-Way The state is entering recovery mode after the flooding killed 13 people and damaged at least 60,000 homes across 20 parishes. It's expected to take months and the governor says the state needs help. 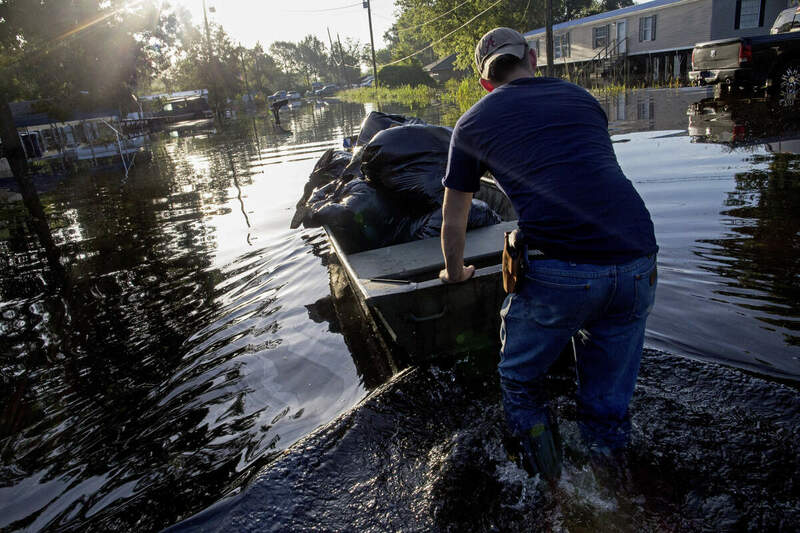 Daniel Stover, 17, moves a boat of personal belongings from a friend's flooded home in Sorrento, La., on Saturday. Louisiana is entering recovery mode after devastating flooding killed 13 people and damaged at least 60,000 homes across 20 parishes. But as Louisiana Gov. John Bel Edwards told CNN, that process is "going to take many months." He added that even though this flooding was "unprecedented and historic," many are "just now realizing how significant it was." 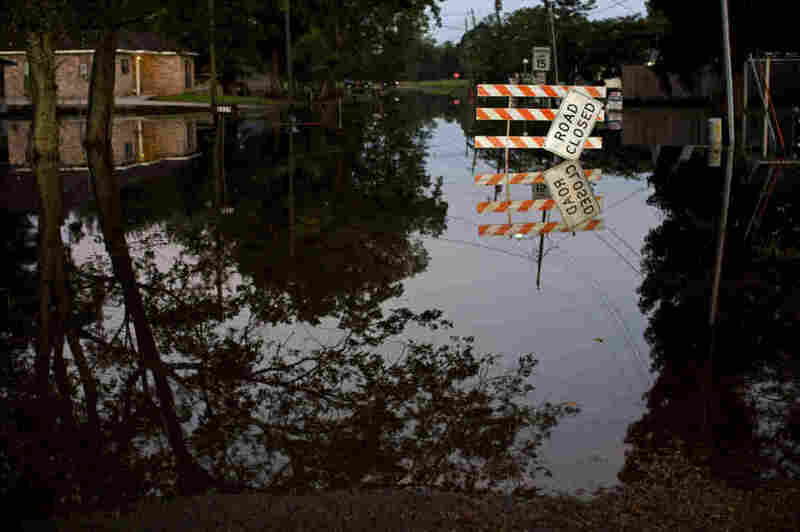 The Red Cross said the Louisiana flooding "is likely the worst natural disaster in the United States since 2012's Superstorm Sandy," and response efforts are "expected to cost at least $30 million." "Typically by this point in a storm, I think Red Cross would be receiving a lot more donations, I think there would be more volunteers signing up. Although we have some of that in place now, it would be very helpful if people would donate to the Red Cross, to the Baton Rouge Area Foundation, and also to come volunteer to help people get back in their homes as quickly as possible." The governor's office said "102,000 have registered for federal help," as the Associated Press reports. FEMA spokesman Rafael Lemaitre said "more than 25,000 have filed flood claims." "The higher local estimate is actually the total number of homes in the floodplain area, whether or not they're damaged. The much smaller number that officials keep repeating is the number of homes that have been reported damaged. "Because payouts can be tied to damages, each side has an interest in setting the number. After Hurricane Katrina, the numbers were still being debated long after the storm, with state estimates much higher than federal ones." Regardless of the number of structures, The Advocate said residents are beginning to dig out their waterlogged homes, creating "massive debris piles" on the streets of Baton Rouge. 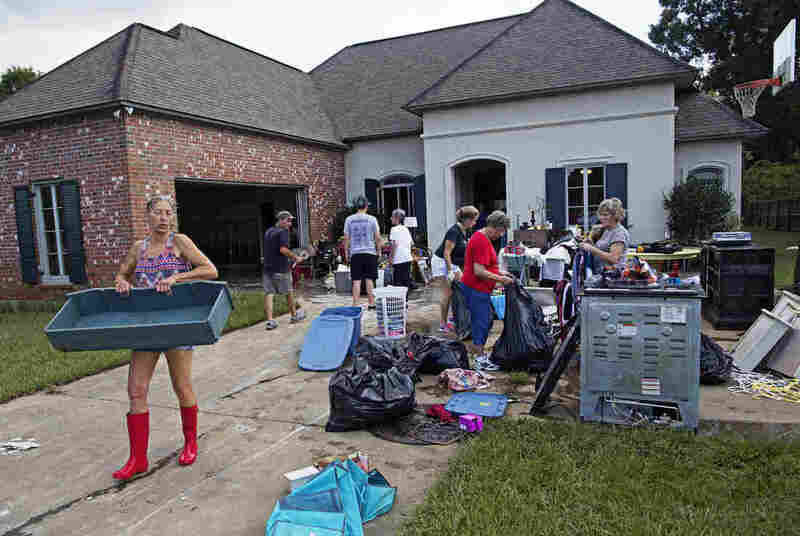 "Clothing and children's toys, along with water-soaked carpeting and sofas and damaged refrigerators and stoves and the bric-a-brac of daily life were stacked outside houses" in the Baton Rouge area, as the newspaper reported. Mike Johnson told The Advocate that his family home was flooded and "just about everything" was lost. "The hardest part of it is a lifetime of accumulation gone in a couple of hours," he said. "Now it's back to the drawing board." As Kailath reported on Weekend Edition Sunday, tens of thousands of South Louisiana residents were taken by surprise at the rising floodwaters, despite warnings. He said "family after family" told him the same tale: "They heard the warnings, and thought — it won't happen to me." That may be because many of the areas hit are inland, and not ones that typically experience flooding. "People have a hard time grasping things they haven't experienced," Marshall Shepherd, the former president of the American Meteorological Society, told Kailath. According to Shepherd, "people around the world are going to see more and more weather for which they have no reference point." Meanwhile, multiple counties in south and central Texas are threatened with flash flooding, with reports of water rescues.